Ruan Lingyu’s career was short, but she spent it building a memorable body of work. Her starring role in The Goddess may be her greatest. A prostitute who is blessed with a young son but beset by cruelty and bigotry, it was the quintessential sympathy-part, but by no means an easy one. It takes a fine actress to keep a role like this from collapsing into schmaltz. And Lingyu was more than fine—she was fantastic. If the city Lingyu’s character works in has a name, I don’t recall it. And it doesn’t matter. The place feels universal—its empty buildings casting shadows over furtive men, out too late to be up to any good, the women who survive by serving their impulses. It is a dismal, familiar place that rarely feels even distinctively Chinese. 'The Goddess' (contemporary slang for prostitute, and the name for the otherwise unnamed woman Lingyu plays) seems to be making a good enough living on the streets. Enough that her infant son is growing and healthy. Enough to keep them both warm in a single-room apartment, with a stove and bed and more than one pretty dress for her to wear—a necessity of the trade. But the work is unstable. Early in the film, the Goddess is spotted by a police officer; she flees him, slipping into a stranger’s apartment to escape detection. The stranger, a pudgy man who lives alone, is happy to oblige his beautiful guest. Many a man’s fantasy has begun this way, I suppose. But this man (Zhang Zhizhi) is a wholly disgusting character—as low-down a scumbag as you’ll ever see. “How to reward me?” he asks her, once the trouble has passed. He grins wide. “Stay the night.” For her, then, this is business; she’s not even allowed the dignity of expressing gratitude. So begins the central tension of The Goddess. The man, a serial gambler and small-time hood, moves in with the mother and child, offering nothing of value but taking a healthy chunk of her income. She escapes him once, but he finds her, and threatens the child; after this she comes to accept him as a burden, hiding her money in a hole in the wall and wiping the dinner table around him as he sits there, smoking. He is worthless, but dangerous. As the Goddess’ child grows old enough for school, she needs the money he’s squandering all the more. It is easy enough to feel for this woman, but Lingyu’s performance adds to her exceptional depth. Great silent film acting wasn’t simply about conveying truth; it required one to do so in a particular key, and Lingyu does that here, holding back—just barely it seems—a wave of emotions. Not just grief and rage, but also swelling joy, like when she hears her son sing in a school talent show. Or nervousness, when the school’s principal visits her apartment to investigate her occupation—something she lied about to get the boy enrolled. A lesser film would have told us, via intertitle, how the Goddess felt; a lesser actress would have fallen back on simple miming. But watch Lingyu in this scene, appealing to the principal, a man she fears, but also believes can be reasoned with. She doesn’t drop to her knees and beg him, nor does she try to seduce him or bribe him; only a dignified approach will work. So she stands before him and makes her case—all the while stroking and caressing her son’s head and neck. She loves this boy and fears for his future; and she mustn’t let him know what is going on. Lingyu gives us all of this. 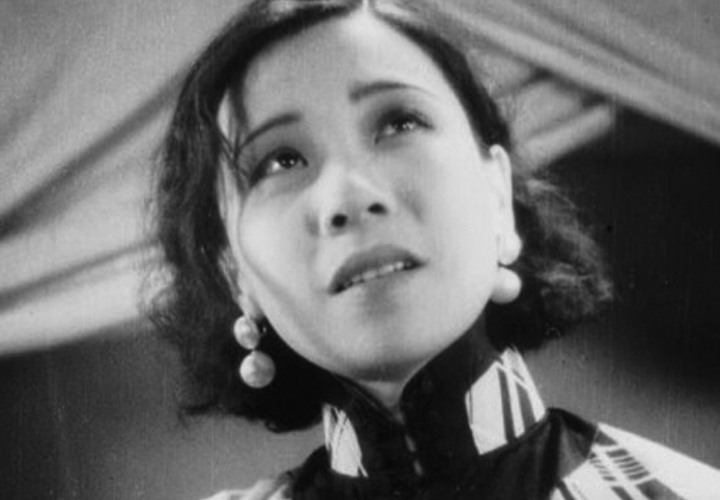 Like the few, truly great silent actors, she could convey multiple messages at once. Her art, like life, was complex. Director Wu Yonggang was a fine artist in his own right. He places his star within drab surroundings, against which the lovely Lingyu, in her elegant gowns, stands out. She never really looks bad. The gambler, by contrast, always does. Yonggang films him in closeup several times, often from below, letting his fat face fill the screen and turning his grin into something offensive. 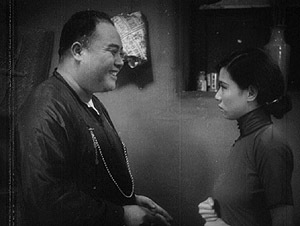 In another film, Zhizhi would look comical; here, he resembles the venal interrogators in The Passion of Joan of Arc (1928). The child, too, is a wonder: a much more appealing presence than the gambler when filmed close up, and so naturalistic that he seems not to be acting at all. Maybe he wasn’t. Lingyu’s chemistry with the boy is remarkable—you believe she is his mother, so much so that only afterward do you remark on how convincing she was. Perhaps she convinced him too? There is a message in The Goddess, but it is a moral one, of the type D.W. Griffith would have appreciated. The villains in this film are lazy men and gossiping, judgmental women. The heroes are those who sacrifice for the greater good: like the principal who resigns rather than throw the innocent child of a prostitute out of his school; and the prostitute who endures abuse and indignity so that her child might receive an education. The story is not complicated; nor, really, is the Goddess. Only her circumstances are. How she will overcome them (if she even can) is what drives the plot forward. There may be something else here, too. In a number of scenes we see the Goddess sitting or standing beneath effigies bearing her likeness—paintings, posters, mannequins. They are not literally her, but they are slender, pretty women with short hair, like hers. When she’s on the street, we see the mannequin; in her apartment, among the gambler and his friends, we see a model in a beer ad on the wall. When she’s tending to her son, we see a picture of an elegant woman in modest dress. Perhaps these are idols, in a way—goddesses of love, debauchery, the hearth, and so on. The heroine feels the need to be all of them, and we are guilty of demanding too much of her. I have seen many films like The Goddess, but I have rarely seen one so well acted. If you can find a copy of this Chinese silent classic, do yourself a favour and watch it, and let Ruan Lingyu’s mighty heart bear you away. It’s a great trip. 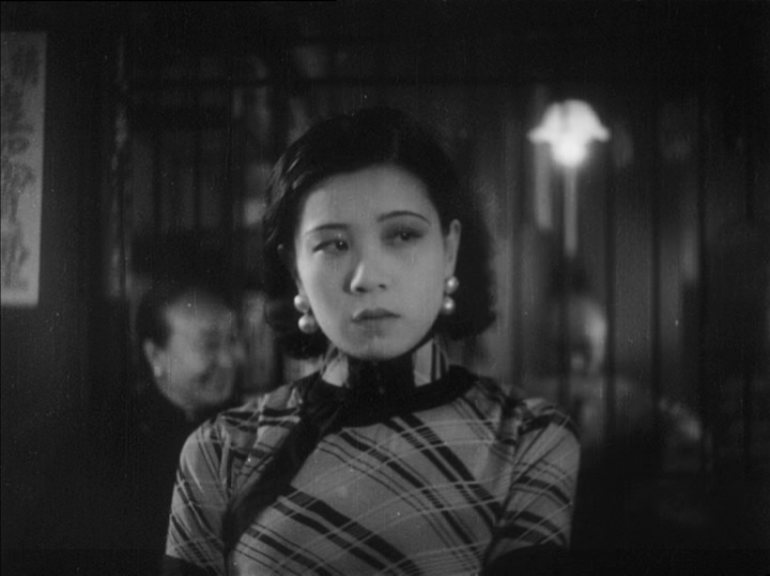 The Goddess screened Saturday, June 22, 2013 at Toronto’s TIFF Bell Lightbox—part of the multi-film retrospective, A Century of Chinese Cinema. Thanks for spotlighting this film. I watched it on TCM recently as a result of reading your essay and was quite impressed upon viewing. Completely unfamiliar with Chinese films of the era but it certainly serves as a great example of the universality of silent film.